North Korea Summit With Trump In Doubt Because Of Military Exercises : The Two-Way North Korea canceled a meeting with South Korea and said the U.S. should think about the fate of the summit "in light of this provocative military ruckus." The U.S. said summit planning continues. 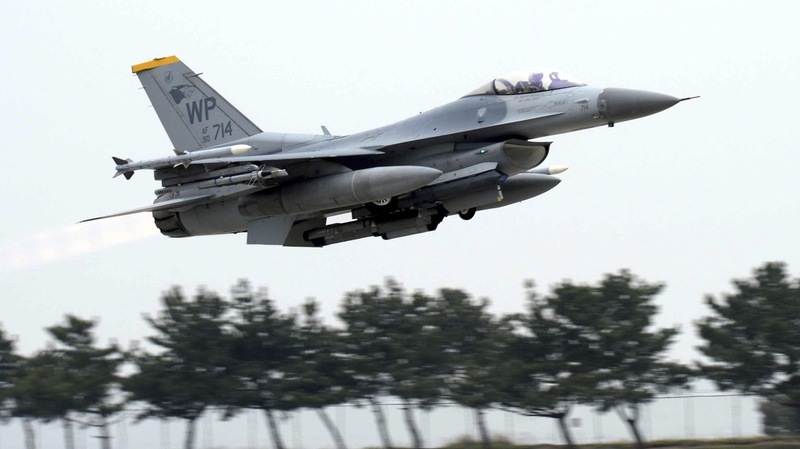 A U.S. Air Force F-16 fighter takes off during annual exercises with South Korea at a U.S. air base in Gunsan, South Korea, in April. North Korea implied the summit with President Trump could be canceled because of the exercises. North Korea said it is canceling high-level talks with South Korea planned for Wednesday at their shared border area because of ongoing military exercises between the South and the United States. The talks were scheduled for Seoul and Pyongyang to follow up on the agreement struck by the two Korean leaders at their historic summit last month. The South Korean government says the decision is "regrettable" and calls on North Korea to resume the dialogue. Later North Korea's first vice foreign minister, Kim Kye Gwan, went further, saying in another statement that Pyongyang has no interest in a summit with Washington "driving us into a corner and making a one-sided demand" for North Korea to give up its nuclear weapons. A lengthy statement from North Korea's state-run KCNA said the Max Thunder Air Force drills, which started on Friday, are a "bid to take a pre-emptive strike" and a provocation during a time of warming inter-Korean ties. It also included a not-so-veiled threat to call off the June 12 summit between Kim Jong Un and President Trump. "The United States will also have to undertake careful deliberations about the fate of the planned North Korea-U.S. summit in light of this provocative military ruckus jointly conducted with the South Korean authorities," KCNA said. The State Department said planning for the summit continues. State Department spokeswoman Heather Nauert said Tuesday that officials "haven't heard anything ... that we wouldn't continue with [military] exercises and planning for summit." Pentagon spokesman Col. Rob Manning said, "The defensive nature of these combined exercises has been clear for many decades and has not changed." On Wednesday, Trump told reporters that "we will see" when asked whether the summit was still on. Asked if he will still insist on denuclearization, the president said, "Yes." The two-week exercise kicked off Friday, involving some 100 warplanes, including eight F-22 radar-evading fighters and B-52 bombers from Guam. While North Korea did not object to another set of of annual exercises that took place this spring, in March and April, the scale of Max Thunder and the bombers amid peace talks invites particular ire. North Korea sees them as particularly threatening to its security and the drills as a rehearsal for invasion. South Korea's government has yet to weigh in on the suspension of talks. "The reality is this could mean a lot of things ranging from 1) nothing, to 2) DPRK [North Korea's] domestic politics to 3) a warning shot about all the US maximum pressure talk to 4) a real change in DPRK intentions," tweeted Vipin Narang, an MIT professor who specializes in nuclear strategy.